Imagine clean, healthy, alkaline water from an undersink ionizer manufactured by the world's leading manufacturer. All you see is an elegant faucet with no more counter-top clutter. 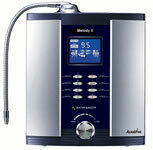 Imagine having the ability to choose different levels of alkaline water at your fingertips. Imagine no more. The IonWays Delphi is what you are looking for. It is one of the most advanced undersink water ionizers on the market today. The Delphi is easier to use and adds class to any kitchen. Just one touch on the control pad on the top of the faucet selects the type of water you want. The elegant faucet has a beautiful LCD display and allows you to get both streams of water - alkaline and acidic - right at the sink. •Dependability - backed by the certainty of Emco Tech - the world leader in ionization. •Unrivalled functionality: Easy one touch operation, Fully featured LCD control panel on the faucet, Never wait for a cleaning cycle. The Delphi employs the revolutionary BioStone Filtration System. The BioStone is one of the most advanced ionization filter available today incorporating Granulated Activated Carbon, calcium and BioCeramic Tourmaline providing you the highest level of filtration and the latest in technology. An ionizer is an investment. You will want your investment to last. The electrodes are the crucial component in your ionizer. All other units on the market clean by a reverse polarity - which still allows some scale buildup which decreases the efficiency of the electrode. The Delphi offers the patented new DARC System (Double Automatic Reverse Cleaning). • Mesh Electrodes - The most advanced mesh platinum-titanium electrodes in the world - backed by Emco Tech's reputation. • DARC Cleaning - Will completely eliminate mineral scaling from the ever important electrodes increasing the life of your ionizer. It also means you never have to wait for a cleaning cycle to complete to get a drink. • The BioStone - The performance of functionality of dual filtration including the revolutionary 9-stage filtration The BioStone filtration system. • MICOM electronics - The MICOM control system optimizes the pH and ORP of your water and helps keeps your ionizer in top working condition. • Flow Control - The Delphi has an inbuilt flow control valve that automatically controls the water pressure through your ionizer to produce optimum ORP at a selected level of pH. • Calcium Port - This allows you to add extra calcium to your ionizer. It is important to note that the Delphi is a very strong ionizing unit and will not require the use of extra calcium in most areas of the country. Some areas however have soft water or water that is low in naturally occurring calcium and other dissolved minerals. This feature is intended to boost ionization performance in those areas when necessary. •Temperature Shut Down - The Delphi employs a thermal switch in the water cell to shut down the ionization process if the temperature in the cell gets too hot. This small but valuable feature gives you peace of mind. •Electrical Protection - The Delphi has a glass tube fuse that will protect the expensive circuitry in case of power fluctuations or surge. 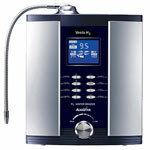 •Voice Confirmation - This feature audibly tells you what type of water you have selected each time you use the ionizer. This feature is fully adjustable allowing you to turn the volume up, down, or completely off. •Alkaline and Acidic level indicators - The Emco tech Delphi has an LCD indicator which will numerically display the level of ionization you have selected. It also has LCD icons that display the most typical use for a given setting. •Filter Life Indicator - The Delphi offers you a way to track the filter life - right on the faucet. It counts actual filter use - it is not a timer like on less expensive models. •pH test kit - Contains reagent liquid and a pH color chart to help you understand the ionizer's performance and so that you can be sure you are drinking the right level of pH. •Installation DVD - Your Delphi comes with a short but very informative DVD showing you everything you will need to know to install, optimize and maintain the performance of your ionizer. •Owners Manual - This beautiful and informative manual makes it all so easy. •Installation kit - Comes with everything you will need to perform a standard installation. Unique or custom installations may require extra parts and or adapters.